But Donna Miller doesn’t see herself as a superwoman. She says she’s just blessed to have a meaningful job. A series of “circumstances” led to her involvement with rehab and Chabad. “I was studying to be a family therapist and wanted to integrate Jewish values into my work. My guidance counselor suggested I intern at Chabad,” Donna recalls. “I did my intern hours, completed my license and then stayed for eight years, eventually developing a family program for our women’s treatment center.” Donna discovered that she loved the field of addiction, and continued working in it at another Jewish rehab center in LA. She offered the center much more than enhanced programming, adding a unique perspective and tools to the recovery strategy. “I used every component of my background that I could. I was trained in promoting adult moral development, which is a different approach for molding and inspiring behavioral changes. Moral education? That sounds like a fit with Chabad. Donna relates, “Chabad got involved with drug treatment over 40 years ago. 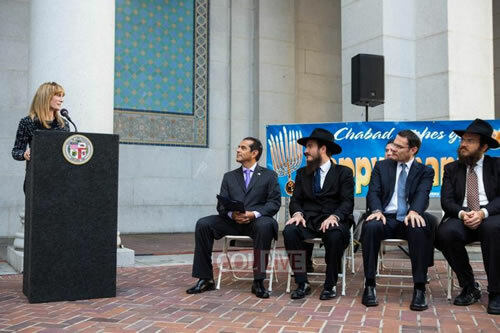 Rabbi Cunin [the director of Chabad of the West Coast] had a Chabad House on the UCLA campus. After becoming aware of the drug problem of some students, he raised his concerns with the Rebbe. The Rebbe emphasized the importance of helping the students to get well, and with the Rebbe’s guidance, Rabbi Cunin opened the Chabad Residential Treatment Center in 1968. He was truly a pioneer in the Jewish community.” Today, although based on Torah values, the center’s programming is nonsectarian and inclusive of all people, regardless of denomination. Addiction is an insidious and difficult disease to successfully treat. How does Donna find the inspiration and strength to fill her day and life with the kind of people many view as hopeless, bottomed out, deeply entangled in a web of negatives? How does she maintain the ability to see a person with a soul, a person worth redeeming in the midst of all the scars, trauma, fears and issues? Donna credits chassidic philosophy as being the driving force behind her work. “My joy and inspiration comes from the Rebbe and Chassidut, even more than from psychology. The Rebbe’s teachings on building from strengths, phrasing things in the most positive way possible, and finding true purpose and meaning all influence my work as a therapist and the development of the program here,” Donna states. While Donna had a strong Jewish background, she became acquainted with Chabad through her involvement at the center. “An intern schlepped me to a women’s retreat. When I saw the level of the women, I was very impressed and moved,” she says. The center provides a positive, warm experience, which helps clients separate from the wounds of their past, connect with their essence and re-embrace a connection with their roots. “We work on healing their underlying issues that led to their addictions, such as self-esteem, family relationships, past traumas. We teach mood management and coping skills, and we incorporate spiritual and Torah principles into their lives,” Donna explains. Donna claims these steps have universal relevance. “As a cognitive-behavioral therapist, I know we all have to do these steps and become more functional.” Even though she is an administrator, overseeing myriad areas such as staff, funding, program development and more, she keeps her feet firmly planted in her passion. “Therapy is my love. I do most of the family and marital therapy, and am heavily involved in helping families and couples unite and heal relationships,” she says. 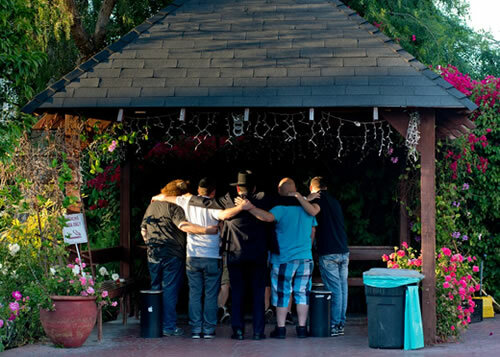 In Los Angeles, Donna Miller catalyzes addiction treatment with chassidic philosophy. Intense work. How does she keep going, especially as tragedy does strike in the addiction community, with relapse and loss? Donna revels in the successes, the life-affirming celebrations and rebuilt lives. “The number of weddings and births we attend, seeing people turn their lives around from great confusion and despair to happy, meaningful and connected lives—that’s the great joy of this work. We’ve been part of so many stories . . . funny, sad, moving, inspiring, and sometimes even devastating,” Donna says with feeling. “Most of my staff were former clients. Helping them continue their education and turn their own personal hardships into the ability to help others and grow professionally is a great reward,” she adds. Not content to rest on her laurels, this warm and dedicated woman wants more—the best for her beloved clients, the brave souls who have hit rock bottom, and who have made the honest and arduous climb to wholeness and healing. For more information, visit Chabad Rehab. More Jewish recovery resources Thank you for your kind response Mrs Karp, unfortunately they're not of Jewish descent, but I am beginning to think of ways to confront them without being insulting , as they are 20 - 30 years my senior. I guess we can only do our best to bring up the subject to raise awareness and provide them with information and contact details of agencies and professionals, as this is not a task that can be managed by an individual without training.